Villa 18 is one of the latest additions to the group of Kejora Villas-Suites and being a four bedroom villa, it offers a fantastic set up for families to enjoy their beachside holidays. 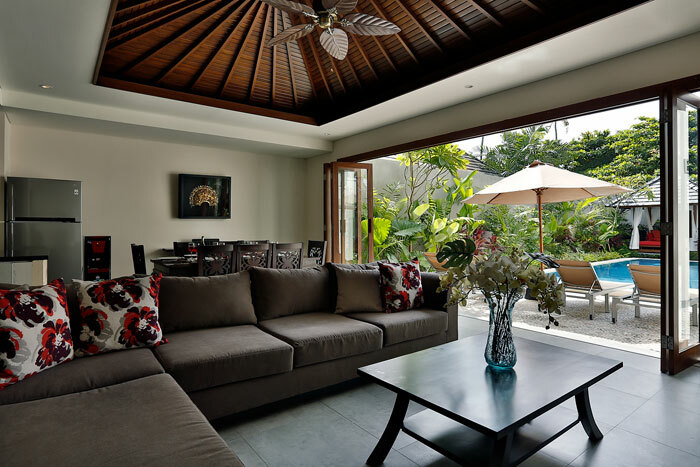 This gorgeous two storey, 4 bedroom villa was open in December in our complex and has had it’s Balinese blessing performed in the villa. 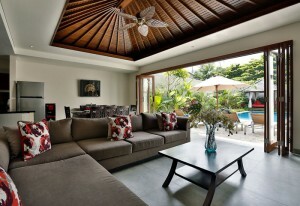 This villa is a wonderful venue for the larger groups. It features 4 king size rooms fitted out with 2 king size beds downstairs with adjoining en-suite bathrooms and upstairs you will find 2 large rooms with 2 large single beds in each of the rooms. There is another bathroom upstairs shared by these two rooms. 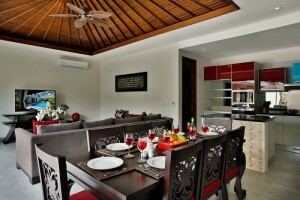 This configuration makes it an ideal villa for groups or families. 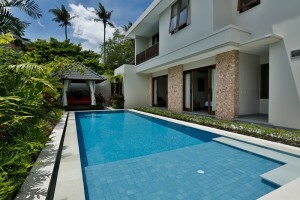 Kejora Villas-Suites offers 24/7 security at the main entrance and the beach entrance. 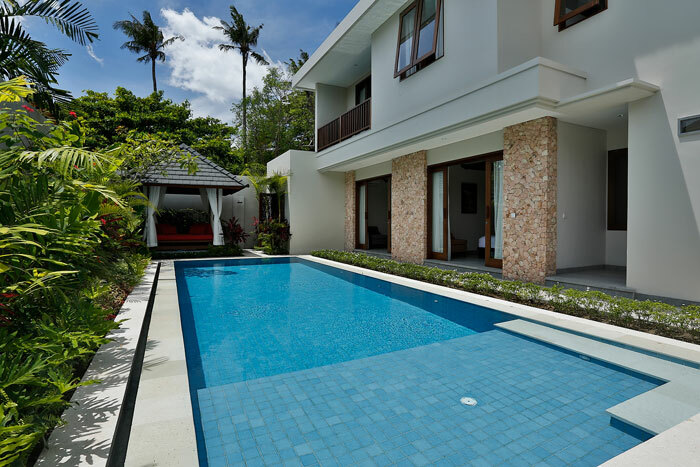 This villa is a spectacular design with ocean breezes from the upper storey. 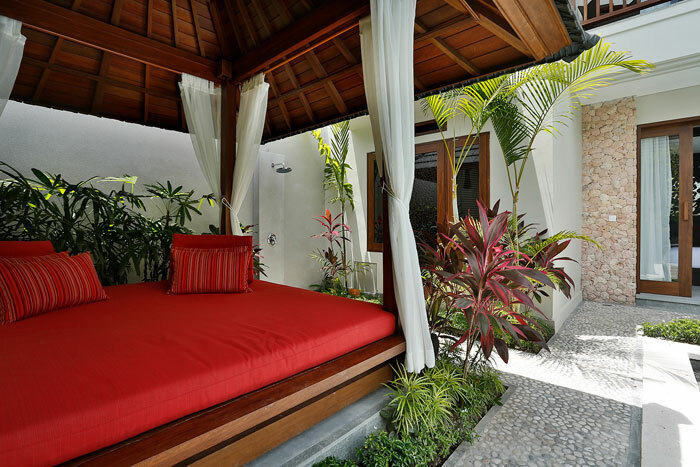 The decor and furnishings are first class and consist essentially of Balinese designs incorporating the use of the island’s natural materials in the carvings on the robes, teak traditional beds, quality wooden tables and a large comfortable sofa. 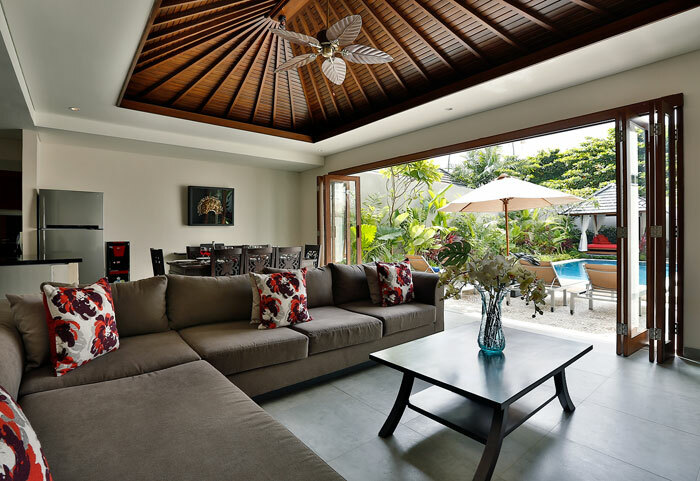 Silks and batiks have been used throughout the villa in the soft furnishings to incorporate the Balinese designs with a modern twist. 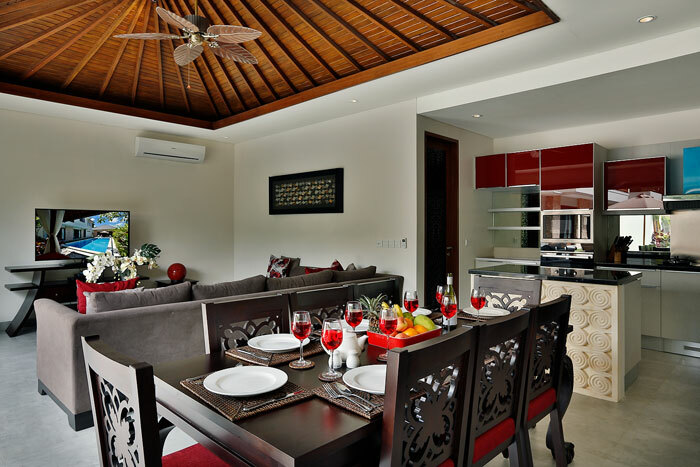 A custom made, designer kitchen has been installed which is fully equipped for any meals you may choose to cook in the villa. High standard appliances are supplied as well as all kitchen requirements. 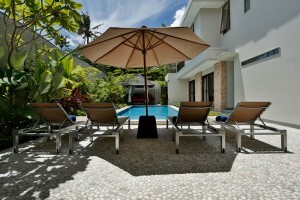 All the modern amenities required by the discerning traveller will be found in villa 18. 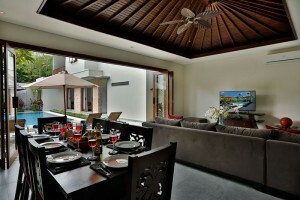 The large living and dining area overlook the sparkling infinity pool. Relax with a book and enjoy the shallow bathing ledge where you can lie in the water whilst reading or having a drink!! Total luxury. 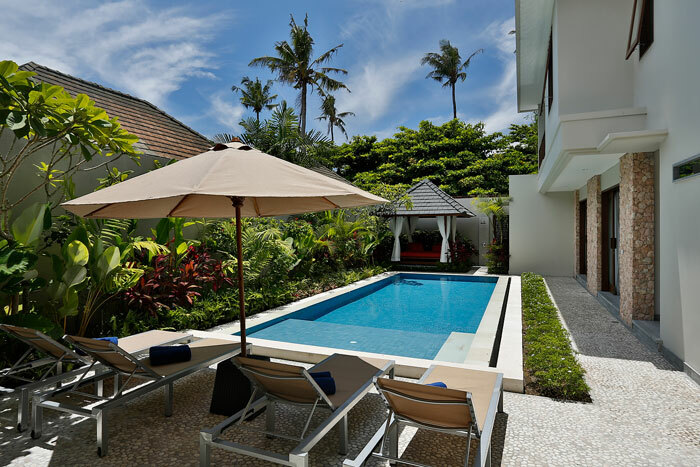 The villa is situated at the beach end of the Kejora Villas-Suites complex and is only meters from the private beachfront entrance. The paved pebbled gardens and pathways create an ambience of quality and the natural stone is safe and comfortable beneath your feet. 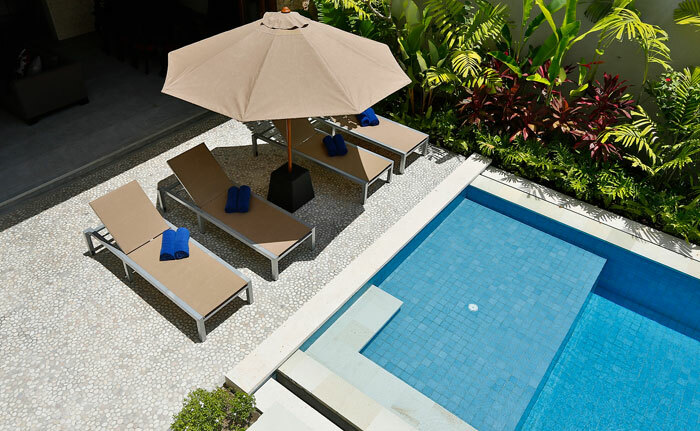 Through the front gate of the complex you will find the Kejora private beach club with loungers and umbrellas so you can soak up the sun and enjoy watching the locals at their work and play. Sundays at the beach are Balinese family days and you will see them bringing the children to the beach to enjoy their day off. There are many water sports in Sanur to experience. 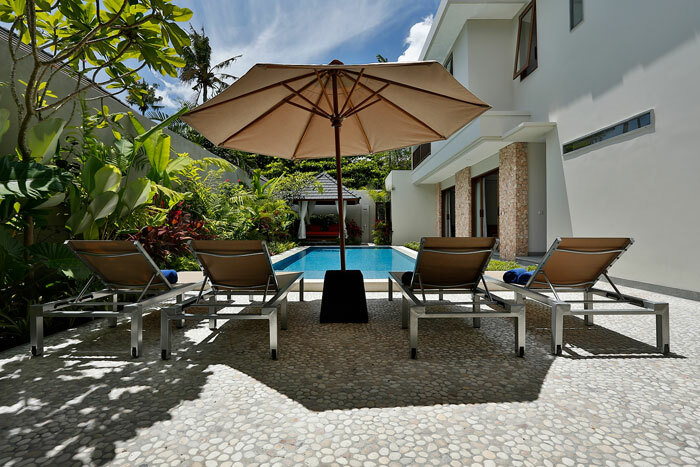 Try your hand at kayaking, sailing, jet skiing, parasailing and swimming and snorkelling out he front of the villas. Take advantage of the 8km of beachfront esplanade to either walk, cycle or jog or just watch the morning sunrise over the water. Many restaurants and cafes are at your doorstep, choose from local Indonesian food, delicious freshly caught seafood or European cuisine along the many restaurants on the boardwalk. At the street end, you have the convenience of supermarkets, cafes, salons and spas as well as boutiques and market shopping. 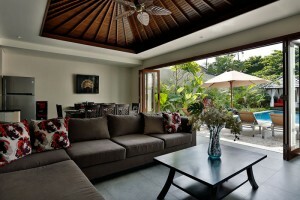 Your stay in Sanur will be unforgettable with Villa 18 at Kejora Villas-Suites as your base. A sensational location! !